I had the opportunity to review Blind Hope written by Kim Meeder and Laurie Sacher. Kim Meeder owns and operates Crystal Peaks a Youth Ranch in Oregon. Crystal Peaks is a nonprofit organization that rescues neglected and abused horses to help children. Blind Hope is about Laurie Sacher and her journey with her dog, Mia. 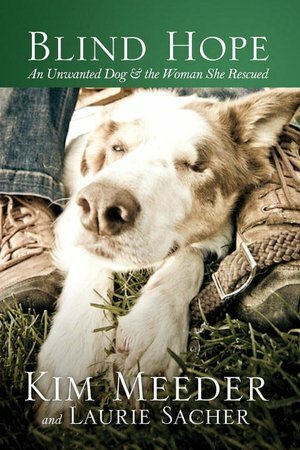 Laurie adopts an Australian Shepered dog, but when she goes to get the dog, it is much different that she expected. The dog is thin, smelly and has some needs. Despite the dogs imperfections, Laurie decides to take the dog and rename it "Mia." As the story continues, we see how "Mia" transforms Laurie's life by bringing her closer to God. Mia, the dog is blind and through Lauries relationship, she discovers God's grace for imperfect people and imperfect dogs. This book is not what I expected it to be.. It is so much more. I love that Mia transformed Laurie's life. I love when God shows up in the most unexpected places. This book was very easy to read and could be read in an afternoon sitting. It is inspiring. This book is more about Laurie's spiritual journey and less about Mia, the dog, which surprised me. Thank you Waterbook publishing for allowing me to review this. I was not required to give a positive review.